In 2014, Goshen College had faced five years of declining enrollment and net revenue when their vice president of enrollment management left. Admissions staff turnover was high, and the team began looking for a solution to remedy the situation. After weighing the options, the team decided to bring in Ruffalo Noel Levitz to provide guidance and direction to the new cross-divisional leadership team (made up of admissions, financial aid, IT, communications, and marketing directors), hoping for a long-term solution to build internal capacity and empower staff. Goshen began their work with Ruffalo Noel Levitz in 2014 with RNL Recruitment Consulting to get them on the fast track to success. It was an intense year of rebuilding their foundation, eventually adding assistance with student search. 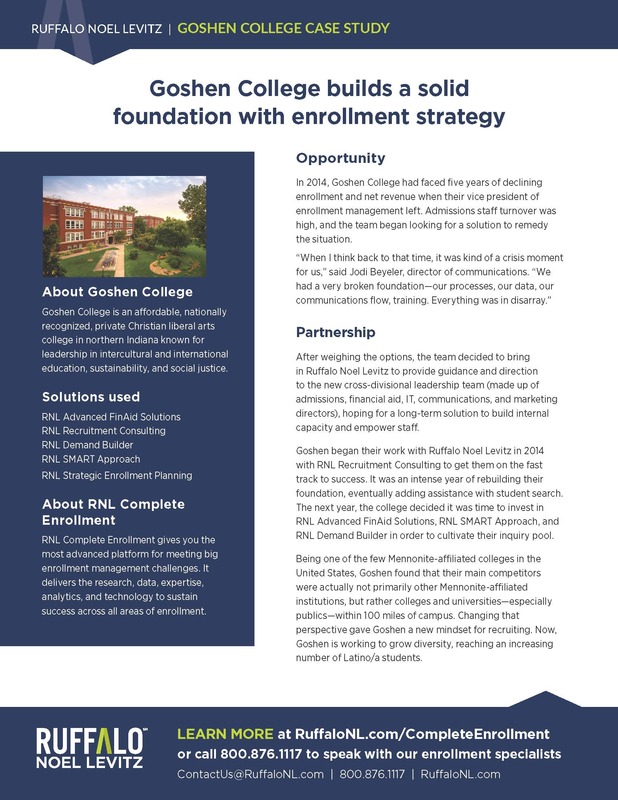 The next year, the college decided it was time to invest in RNL Advanced FinAid Solutions and RNL Demand Builder in order to cultivate their inquiry pool. 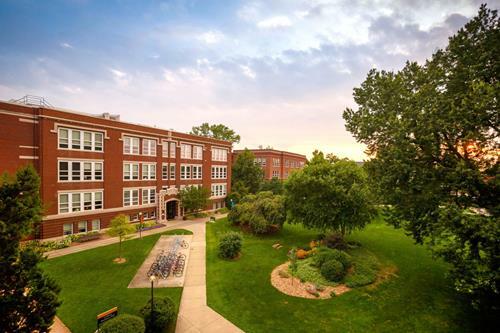 Being one of the few Mennonite-affiliated colleges in the United States, Goshen found that their main competitors were actually not primarily other Mennonite-affiliated institutions, but rather colleges and universities—especially publics—within 100 miles of campus. Changing that perspective gave Goshen a new mindset for recruiting. Now, Goshen is working to grow diversity, reaching an increasing number of Latino/a students. Improving reporting and analytics to support recruiting and marketing strategy. A 37 percent increase in first-year applicants over three years (860 in 2014 vs. 1,176 in 2017). A 56 percent increase in admitted first-year students over three years (482 in 2014 vs. 752 in 2017). A 35 percent increase in the number of enrolled first-year students since 2014 (159 in 2014 vs. 215 in 2017). Growth of the percent of overall traditional undergraduates who are Latino/a from 13 percent in 2014 to 20 percent in 2016 (with expectations for further growth this year). A healthy 38 percent net tuition revenue increase over two years. With optimism and high morale, the Goshen team enrolled their largest incoming class in eight years to their goals for 2017 while maintaining class profile.